Hypertension has traditionally been regarded as a rare occurrence in childhood and adolescence; however, there is compelling evidence to suggest that elevated blood pressure is increasingly common in this population, particularly in those with obesity. As a result, pediatricians increasingly are expected to evaluate and manage patients with elevated blood pressure. An increased emphasis on conducting drug trials in children over the last two decades has yielded important advances with respect to evidence-based data regarding the safety and efficacy of antihypertensive medications in children and adolescents. Despite these advances, data to definitively guide selection of first-line antihypertensive agents is lacking. 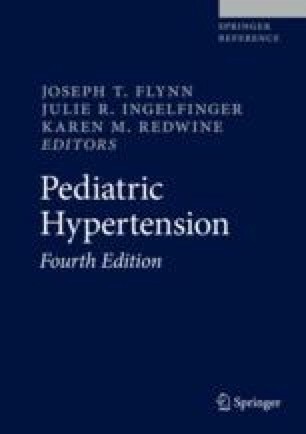 This chapter provides an overview of antihypertensive drug therapy in children, including indications for treatment. A detailed review of available antihypertensive agents is provided with an emphasis on pediatric specific data with respect to dosing, safety, and efficacy. In addition, a rational approach to selecting an appropriate medication with respect to pathophysiology, putative benefit, and likelihood for side effects is reviewed.